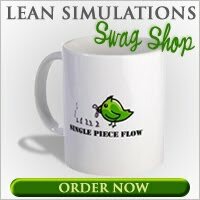 Here's a great little video of a lean simulation, put together by a team of university students. Using a humourous approach, they show how to run a lean simulation using paper airplanes. This video could even stand as a training tool in and of itself. You can learn basic lean concepts just by watching the video, but nothing beats doing it yourself! Watch the video and see how they pull it off. I'll break down the paper airplane simulation steps below the video if you're interested in details. If you can't see the embedded video above, you can watch it on youtube here. This particular lean simulation is done with 4 operators, but could be modified to run with more. The key is to make sure that one operator has more work than the others, so a bottleneck is created. Even better, create two teams to compete against each other. I've outlined the steps below, but I discovered it's pretty difficult to describe how to fold a paper airplane with just words. Perhaps another game can be created out of this, similar to Standard Pig? Update: I've created a one-page graphic to illustrate the steps below. Click here to get it! Operator 1 folds the paper in half length-wise. Operator 2 opens the paper and folds 2 points to the centre-line. Then he folds the pointed end down and folds the paper back in half again. Then he tears off a square corner of the folded paper. Total: 1 open, 4 folds and 2 tears. Operator 3 opens the paper and folds two corners to the centre. Then he folds the first corner through the tear that was made by operator 2 and folds the paper in half again. Total: 1 open, 4 folds. Operator 4 folds the two sides down to form the final wings. Total: 2 folds. It's clear that Operator 2 has significantly more work and inventory soon builds up. At some point introduce a coloured paper and time how long it gets through the system. Make sure the orange paper follows through the queue of inventory properly. No jumping the line! No change to the steps each operator does. Kanban is introduced by only allowing two spots for inventory. If both spots are full, then upstream operator must not produce. Scissors are introduced for operator 2 and a scrap bin for the off-cuts. Packaging used for finished goods. Raw material has a designated labeled spot. The main focus in Phase 2 appears to be kanban to reduce inventory and 5S to improve workplace organization. But the line is still unbalanced and everyone will be waiting for operator 2. Operator 4 folds the plane in half and then folds the two final wings down. Total: 3 folds. Looks like the workflow is balanced and everyone is happy! This is a fairly simple lean simulation to perform using only standard office supplies. The video is nice, since it shows the steps for each phase. You could do this with pretty much any paper airplane set of instructions, but this one seems to work well, since it requires a cutting process. Like most lean games, it's important to run a sub-optimal process first with a bottleneck, so that everyone can see how inventory builds up. Then introduce limits to work in process to reduce inventory in the system. Finally, do some work balancing to speed up the overall cycle, or reduce operators. Have you led or participated in a paper airplane folding simulation? Was it like this one? Or did your airplane look different? Let us know in the comments below. I've added this post to my massive list of lean games and simulations! Cost ranges from trusted brand. mixcloud simply hook the inlet tube up to best washer and dryer extremely reduced maintenance. Washer Dryer Combos of 2018 do away with the agitator for more capacity top rated washer and dryer you unload a capful in the drum itself. official guide washing done and also obtain it done quickly.